Enjoy a peaceful yet central location at the new JADE Vancouver condo residences, a boutique project by Killarney Enterprises (Fraser) developers. Ideally situated at the crossroads of Fraser and 43rd Vancouver East district, the quiet, family friendly and well-established neighbourhood is packed full of amenities and services for you and your family. Memorial South Park, sports and recreation fields, running track and tree lined streets are just some great things about the East Vancouver JADE condo neighbourhood where new homebuyers can enjoy a liveable, sustainable and very healthy environment around them. As well, Langara Golf Course and Langara College are just a few minutes away by bus. Oakridge Mall with over 150 shops and services are also nearby with an exciting new development in the planning stages. The boutique JADE Vancouver condo residences will also feature close proximity to top ranked schools for children of all ages, universities, dining and shopping options. In terms of recreation, the new East Vancouver condominiums will be close to the Sunset Community Centre, Sunset Ice Rink and many urban parks. Five minutes is all it takes to get to the Canada SkyTrain Line, which is the transit hub that can take you anywhere in the Lower Mainland, whether it be downtown Vancouver or Richmond. Boutique Vancouver residences in a great location are now selling! Jade is a rare find. The 29 boutique residences are comfortable, stylish and affordable. The East Vancouver Jade condo neighbourhood is well established and quiet. And the central location at Fraser and 43rd Vancouver is perfect. Oakridge Mall and the Canada SkyTrain Line are just minutes away from your front door. Simple yet elegant, Jade Vancouver boutique residences is an opportunity to get exactly what you want. Brought to you by Killarney Developments. You can find more information online at www.liveatjade.ca. The project will offer a wide array of floor plans including 1 bedroom, junior 2 bedroom and full 2 bedroom homes. All homes will come with the comprehensive 2/5/10 third party warranty by National Home Warranty and the building will have an enterphone security system at the lobby entrance in addition to secure FOB access for residents. The East Van Jade Condo building will also feature an underground secured parking lot with secured bike lockers. There is a full sprinkler system installed and in suite rough-in for security system too. All homes come with solid core suite entry doors as well. The convenient location of the East Vancouver JADE condos puts you right at Fraser and 43rd Avenue, a central place to call home in a well established community with old-growth trees, urban parks and conveniences. Just minutes away from Oakridge Mall as well as Langara College, the new JADE Vancouver East Condos are also just minutes away from the Canada SkyTrain Line, which makes the project location even more unique and convenient. The 29 homes at JADE Condos in East Van will feature premium kitchens that include a stainless steel appliance package by KitchenAid (this includes an Architect Series II six cycle dishwasher, slide-in electric range and fridge with a bottom mount freezer with lots of storage space). The fabulous kitchens also feature solid polished quartz high-end counters and sleek stainless steel undermount sink. There is in sink waste disposal in addition to glass tiled backsplashes. The JADE Vancouver East condos will also feature durable shaker style two toned cabinetry, under cabinetry lighting and soft close cabinet doors and drawers. There’s also a high-end pull-down kitchen faucet with vegetable spray. The beautiful bathrooms at the new East Van JADE Condos will feature deep soaker tubs and solid polished quartz counters (like the kitchens). There is hand set porcelain tiled flooring in addition to customized vanity mirrors. Stylish chrome accessories and under mount sink with modern faucets will grace the bathrooms and all homes will come with energy efficient dual flush toilets to conserve water. 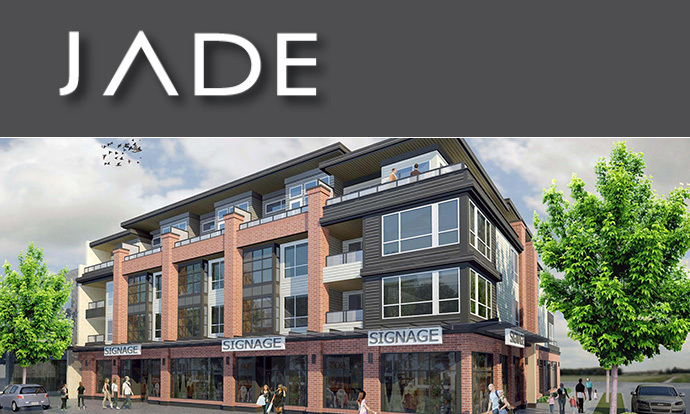 The truly liveable homes at JADE Vancouver will also feature solid core entry doors for added security and sound buffering in addition to front loading dryer and washer by Frigidaire. There is pre-wiring for a security alarm system in addition to high-speed internet and cable services. Most of the floor plans will feature private decks, enclosed balconies and large terraces for outdoor enjoyment throughout the year. The bedrooms, dining, living, kitchen and entry spaces will have premium laminate hardwood floors that are durable and low maintenance. In addition the new JADE Vancouver East condos will feature two designer colour palettes called Manhattan and Brownstone that are carefully designed and selected by MID Consultants Interior Designers. Also, there are only 29 homes for sale.